Lemax Officer Snowflake Figurine depicts a fun neighbourhood Snowman with a difference, where Children have delightfully dressed our snowed friend in a Police Officers uniform. Officer Snowflake is unique and unlike any other Snowman in the neighbourhood, earning his place in and amongst any Lemax Santas Wonderland village scene. A delightful Lemax figurine who recently joined the Lemax collection in 2015. 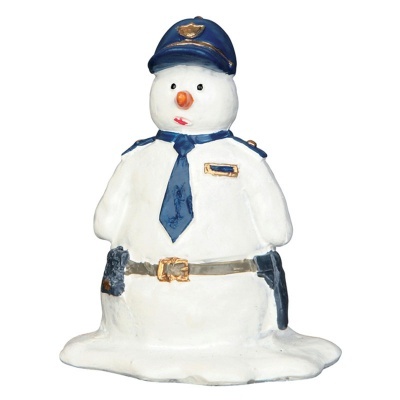 Officer Snowflake is a single individual hand painted polyresin figurine mounted on a single snowed base to compliment your seasonal Lemax Village Christmas display.